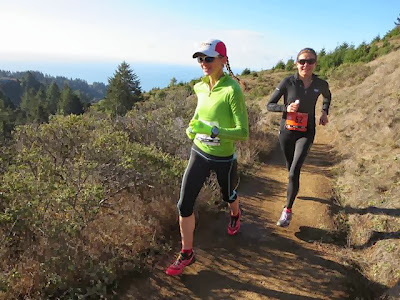 If being one of the country’s best marathoners wasn’t enough, she’s also an ultra runner, placing first in the Tamalpa Headlands 50k this past August. The multi-talented Caitlin is a running coach, pilates trainer, yoga instructor, doula and artist. And I had the distinct pleasure of interviewing her! While she majored in Justice and Social Change at the University of Michigan and earned a M.A. from John F. Kennedy University, she focuses on creativity, especially in the form of movement, in her life. I met Caitlin at a running, yoga and wine retreat in Marin County in late August. She led several sessions on core strength for runners and shared her philosophy for incorporating strength training into her running sessions. I was intrigued by her stillness yet enlivened by her love of movement. Here are excerpts from my interview with her in early October. Caitlin starting dancing at the age of five. In sixth grade, somewhat out of the blue, the school’s track coach approached her and said, “You’re a long distance runner.” Her attempt at one lap around the track didn’t convince her—not to mention that her dance teachers were less than happy with any running. While dance remained her primary focus, Caitlin ran cross-country in high school and recreationally in college. After graduating from college in 2002, she jumped in Grandma’s Marathon on a whim, BQ’ing in the process. After subsequently running Boston, she stopped racing until 2007-2008. Surprisingly, even after a promising start she didn’t have the confidence to see herself as a competitive runner. Around that time, Caitlin moved to the West Coast where she entered many trail 20k races. At one race, in a deja vu moment, a runner approached her, “Who are you? Where did you come from?” He was impressed with her inherent speed and ease at trail running. Finally, in 2009 after winning nearly every trail race she’d entered and the Nike Women’s Marathon in San Francisco, Caitlin realized that maybe she WAS good at long distance running. Still though, it wasn’t until after a femur fracture prevented her from running or training for three months that she decided she needed to find a coach and find out how well she could run. When Caitlin decided to try to qualify for the 2012 Olympic Trials in the marathon she began seeking a coach. After several unsuccessful attempts at finding a coach who understood her running style, she started training with Magdalena Boulet, a name you might recognize! Magdalena is herself an Olympian and most recently the Western States 100 champion! Caitlin discovered that she and Magdalena shared a philosophy about running, a love of the trails and the recognition of the importance of being part of the running community. Caitlin pacing her coach at Western States! Treadmill at incline, where she focuses on the effort used. Shorter track intervals (200s and 400s). Long runs on Sunday with some of the miles at marathon pace. On a daily basis she incorporates at least 10 minutes each of strength training and stretches, including running specific activities to keep her hips mobile and strong. Caitlin doesn’t have a specific diet regimen, instead focusing on healthy, more natural foods, including lots and fruits and vegetables, some meat and bread. She finds that the more she runs the more her body craves “good” food, so she doesn’t find eating healthier an issue. During longer runs and races, she generally consumes calories through drinks containing powdered gels. We all remember dreaded runs; well, even the elites experience them. When asked about her worst runs, Caitlin included a six-day stage race she participated in with a femur stress fracture. She ran on it for several days before finally dropping out when the pain became unbearable. She hoped the 2015 LA Marathon would be an OTQ for her, but with the very hot and humid weather, she didn’t succeed. She dusted herself off, regrouped and nailed it at Grandma’s this past June. Parts of the 2013-2014 running season are also memorable for not doing as well as she’d hoped or liked. She was exhausted coming into the season, having raced the North Face 50, overtraining, low iron, and heavy legs. Caitlin listened to her body and backed off running for a while, focusing on getting healthy. Now, in 2015 with a very successful season to date, she is once again very excited about running. I had to ask her if she thinks her success is do more to talent or hardwork. I think her answer speaks for itself! I am a strong believer that hard work goes much farther than talent. Luckily I love to run. This love has pushed me to put in the hard work and see where it will carry me. I know that many people have said that I must have some natural talent, but personally I am still not sold. When I look at the people who are doing well in the sport I see a lot of hard workers that have a passion to run and push themselves. We all have our strengths and weaknesses. The key is working on your weaknesses and supporting your strengths. I know I will never be a fast miler, but if I work on my speed while still doing the things that I love and find easier like long runs on the trails I will find more running success. It’s a balance of work and reward and not throwing in the towel when you really feel like it. There is nothing easy about this sport, but that’s what I love about it. Caitlin somewhat tongue in cheek said the best running advice she ever received was from one of her high school running coaches: enjoy the rain. He explained that once at a championship race the other runners were upset that it was raining. He didn’t complain; he felt the rain. He didn’t treat it as a negative, instead used it to stay in the moment. Not surprisingly, he won the race. From this advice Caitlin learned the importance of being positive and in the moment. No surprise, running in the rain is one of Caitlin’s favorite things to do! Caitlin was not comfortable with or certain about her running abilities for years. Even as we spoke, I could hear some self-doubt in her voice. Like many women, she tends to underestimate her capabilities. To counter-balance this negativity, she tries to fill her head with positive thoughts to carry her beyond her own expectations. There will always be negative voices and self-doubt, so she encourages women to work on the mental aspects of running. Acknowledge your achievements. Rejoice in your wins. Celebrate your victories, whether small or large. Caitlin qualified for the Olympic Trials in 2012; however, she did not finish the race. Today, when thinking about the 2016 Trials, she’s not as nervous. She’s enjoying the camaraderie and community of runners, feeling more comfortable running with a pack, and has more confidence in her capabilities. She has a very good relationship with Magda, her coach and friend. She’s coming off a very good year of running. In 2016, she wants to test her limits, to feel completely exhausted and depleted at the end of a race. She believes she can have the opportunity at the 2016 Olympic Trials, perhaps even bringing her current PR to the 2:30’s range. She’s realistic, though, understanding that many factors will affect her running on any particular day. This is why she continues to invest time and energy training for the Olympic Trials: to run with the best US women marathoners, to test her own limits, to share a special day. Can you relate to Caitlin’s story? What would you like to know more about her? Great interview, Sage! Caitlin is really something else – I can’t believe it took so much success to convince her she had talent! And then, of course, there’s her incredible ultra running wins! I’d like to hear more about her doula practice and how her experience as an athlete helps her assist women through labor and delivery! I myself have yet to have kids and there is no doubt that my best way to relate to my clients is through my experiencing racing. From clients I’ve had that were runners having a baby is WAY harder because it’s an endurance event that is brand new for most couples (unless they’re having a second or third, etc) and no one knows how long it will last or how difficult it might get! All that said I believe our bodies can tolerate more than we think. Cortisol is a pregnant woman’s worst enemy and the same goes for a runner before a race. The second we get stressed and anxious we our fighting our bodies and we begin to feel more pain. My hope is that I make my clients feel at ease, strong, and capable. My doula bag also has similar fuel items from races, GUs and electrolyte tablets. When clients get tired I find these can provide a good pick me up. My clients are extremely inspiring. I’ve often had races where I think I can do this, I just saw that woman have a baby! I told one of my clients this and she said, but the thing is you don’t get a baby in the end so how do you do it? That’s awesome, Caitlin! We took Bradley classes before our first and my husband approached L&D like a coach! It was great! And I definitely noticed I handled the pain of L&D the same as marathoning. Coincidentally, my friend got her OTQ on Sunday and she texted me to tell me it hurt more than delivering a baby! Ha! Great interview, Sage and Caitlin. I enjoyed learning more about your journey and will be cheering for you at the Trials!